Cares Melt Away While Dreams Come True at La Vida.... La Vida is 'The Life' And you will realize it as soon as you set down your bags, breathe in the ocean air of the tropics, and enjoy the spectacular view. From the morning's first rays of light peeking over the mountains to the last glowing embers of the sun slipping into the sea, a panoramic bird's eye view is yours and is truly stunning. 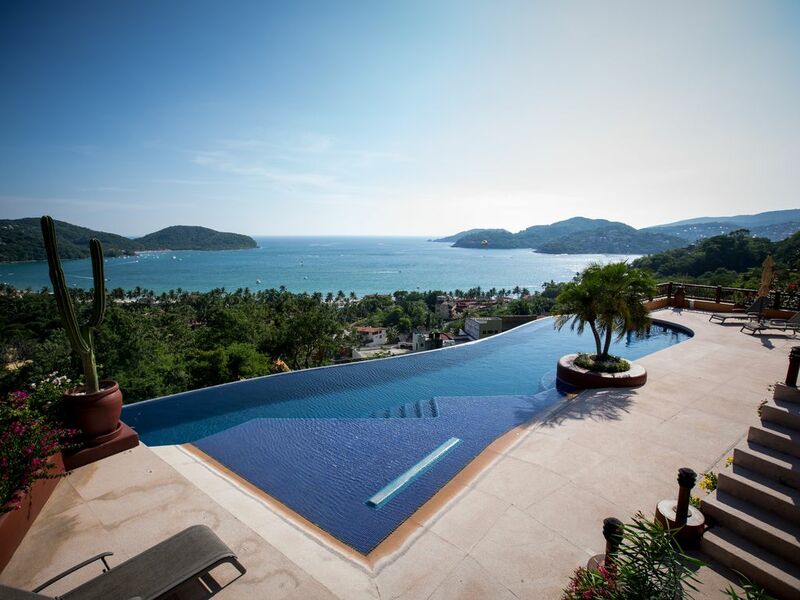 One of the nicest features of this spacious 2 bedroom condo are the stacking glass doors spanning the entire front living area and when open offers an unobstructed view of the gentle, curving bay of Zihuatanejo. Casa La Vida's special location provides excellent vistas but is located very close to the protected bay. Enjoy great swimming and snorkeling without all the crowds. You will feel like you are on top of the world but the soft, golden sand is only steps away from your door. Inside Casa La Vida, the outstanding amenities include king size beds with mattresses that are truly comfortable. Lots of pillows and sumptuous Egyptian cotton sheets. This adds to the pleasure of being lulled to sleep by the sound of the waves lapping at the shore. Wake in the master bedroom in what could be described as an infinity bed, another spectacular view of the bay with the ocean beyond. The guest bedroom also has a comfortable king and opens to a small private terrace. You will enjoy preparing meals in our sparkling new, quality crafted kitchen. Granite counter tops provide ample room and modern appliances include a refrigerator providing cold, drinkable water and ice at the push of a button. In fact you can feel confident about drinking water from all the taps as the entire complex has a state of the art water filtration system. Both bathrooms are quite luxurious, huge showers feature built in marble benches and the towels are thick and fluffy. The restful breezes of the bay are always pleasant but if you want to cool down a bit more, there are fans and quiet air conditioning in all rooms. When leaving the condo you can feel secure. There is a built in safe for your valuables and the building has electronic locked gates, an intercom system and private elevator. At the beach you can engage in a multitude of sun, sea and sand activities or you can just leisurely stroll along the waters edge. The many beachfront restaurants allow you to enjoy quite an assortment of gourmet culinary delights while wiggling your toes in the sand. A different dining experience for each day of the week is possible. Some of our favorites are Paty's where fresh fruits and vegetables accompany a large variety of seafood and traditional Mexican dishes. Try a glass of fresh squeezed orange,papaya or pineapple juice with breakfast. Paty's also offers morning yoga classes upstairs.Friendly waiters, Arturo and Raul are always happy to see you. Arrive in late afternoon and you will have the opportunity to catch Happy Hour at one of the many breezy palapa restaurants along La Ropa beach. What better way to unwind from a long flight than drop off your bags at the condo and head for the beach? The Coconut shrimp at Elvira's is heavenly and the after dinner Kahlua and cream is a nice touch. La Perla is a little farther down the beach, the breezy open-air bar stocks different varieties of tequila just right for sipping or made into one of the best Margaritas on the beach. Second only to the view from La Vida's terrace, the beach restaurants are all wonderful spots to watch the sunset. There are also many things to do just a taxi drive away. Many of the drivers speak excellent English and arrangements can be made for quick trips or all day excursions. Some of the water activities you can enjoy on the bay are jet skis, kayaks, parasailing or riding the banana boat.For something extra special, book a snorkeling or sunset cruise on the catamaran The Picante. Even water skiers get out on the bay in the mornings when the surf is calm. There are open aire tents at the motels on the beach for massage. It's a very relaxing treat to be pampered with the sound of the waves, the soft breeze and skilled hands. Ixtapa (just over the hill)offers the nightlife and there are two top notch golf courses. While Troncones (about a 45 min. drive )is popular for surfing and long quiet stretches of beach to gather shells or stop in at one of the many restaurants for lunch or just a cool drink. When you stay at the Casa La Vida you are part of an exclusive complex of only 6 units. Some of the other residents are there full time, there are no crowds. Respect for the tranquility and privacy enjoyed by all is of the utmost importance. Casa La Vida is a non-smoking condo. The tranquil nature of La Vida is such that it is more suited to adults, we do not allow children under sixteen. Check-in time is 3pm Check-out time is 12:00, If you have a late flight you are welcome to store your luggage and use the pool, there is a shower, bathroom and changing area. Our large infinity pool is never crowded and is located down a short path just below the condo. It's a great location to take a quick dip, lounge the day away or celebrate with a toast at sunset. Another wonderful day in paradise. You can swim in the bay, walk everywhere and enjoy fresh gourmet meals at home or at any one of the casual restuarants near by.When we are at Casa La Vida, it is private, quiet and relaxing.And I honestly don't think there is a better place to enjoy the sunset than our own terrace. Just The Best As Always! We stayed here 4 years ago and appreciate it as much or more than we did then. Rich, the owner, seems to really care about this condo and it is kept up very well. The property is perfectly maintained overall. Rich’s condo is so private but has perfect access to the pool area. You can pull the folding glass door across if you wish to but we never did .. loved feeling so close to the outdoors. The kitchen is perfectly equipped and it is so nice to have the washer/dryer. Great access to Playa La Ropa. We love having a good little workout but the walk or hike back up may be a bit much for some people in the heat. No worries though .. the taxi drivers are accommodating at a price! You can book this place with confidence. We love it! This is our second stay at Casa Zih. As we are getting ready to make our way back to the far North, we are already making arrangements to return. Our condo is clean, modern and convenient to stores and restaurants. We prefer to eat most our meals in, so we love having a fully equipped kitchen. If you want a large all inclusive complex, this place is not for you. We share a pool with six other units, but most days we have the entire pool to our selves which is only a few steps from our front door. It's quiet and relaxing. The sunrises and sunsets are absolutely spectacular and it's a great place to watch the stars at night. It's a 5-10 minute walk to the beach where there are plenty of places to eat, swim or partake in other beach activities. Most importantly it's a gated complex and extremely secure and safe. The staff is awesome and we've been able to easily arrange rides to and from the airport as well as rides to the large grocery store, or able to arrange excursion anywhere. If you need a guide with someone who speaks English, that can be arranged. Stunning view! Complete paradise! Look no further! I have been to all the obvious Mexican beach towns but Zihuatanejo is by far my favorite. In this, my 14th visit to Mexico and 3rd visit to Zih, I have found the perfect accommodations. This condo is an ideal home away from home in so many ways but most importantly is the superb floor plan and it's spectacular view! Nestled high up the junglesque hillside, there is no need to go "out" to the balcony to experience the view because the panoramic view of the bay, the big sky, and the outdoor fresh air with its ever-present light breeze simply intertwine with daily life inside this comfortable home. Cooking was a joy because we felt as though we were "one" with the outdoors! When we opened the huge, glass wall/door (which I had never seen before) there was really no reason to ever leave! The view and lovely breeze are the same from the master bedroom! The photos can not possibly do justice to this amazing indoor/outdoor open living floor plan! The decor may seem slightly dated in the photos, but in reality it all flows together beautifully! Adding to the brilliant design of this unit... the gorgeous infinity pool is a few well-placed steps away. There are only six condos in this building and we had the entire place nearly to ourselves. The spacious and well-designed bathrooms and closets are perfect. The kitchen had everything you would ever need or want. LaRopa Beach is a pleasant 8 to 10 minute walk (albeit a steep one) away - along with small stores, restaurants and bars. We also walked to and from El Centro and to Las Gatos Beach. I highly recommend walking there if you are fine with hiking through a rocky path for a short section. However, taxis are everywhere all the time and super inexpensive. Forgot a book to read? No worries. Plenty to choose from. Who knows if the tv works? Why would anyone turn it on in paradise? Wifi was easy and troublefree. I can not recommend this place highly enough! However, if you are the type who likes to be in the middle of a lot of action, this is not the place for you. We just returned from two weeks staying at this wonderful property. The condo is exactly as the pictures show! I cannot imagine what could be done to improve upon it... it was FIVE STAR all the way! It has a breathtaking view (totally open to the veranda), very luxurious finishes and was completely stocked. Very quickly it became my home away from home! The town of Zihuatanejo is very quaint and Mexican authentic...without the crowds. The beaches were lovely and Playa La Ropa is one of the nicest beaches I have ever seen and just a short 15 minute walk down hill. Speaking of "the hill"... there is a steep incline (200 yds or so) to get to this magnificent view but taxi's are abundant and there is no need to climb the hill if you are not keen on working up a sweat. We were very impressed with the amenities in town and the restaurants were really excellent. We felt very lucky to have been able to stay at this property. The manager, Filberto is a pro. He made our landing seamless and was very helpful getting us all stowed away. My favorite part was meeting our taxi driver, Andres, who took very good care of us, day or night (I believe he comes with the condo...ha ha). It was like we had our own personal chauffeur! The grounds are well maintained, and it was fun trying to speak Spanglish to the care-taker Noe, who also was just a really nice guy. The linens were immaculate, and the house-keeper, Aurora, does a great job of keeping everything spotless. Many thanks Rich for sharing your little piece of paradise. Fingers crossed, we'll be back! the view is so important and it has one that is breathtakingly beautiful. To wake up every morning to the sounds of the waves and the view of the boats in the bay is heavenly. This lovely condo is well equipped and we eat in quite a lot because it has such a great kitchen and the fresh produce available at the market is incredible. The condo is clean, very spacious and nicely decorated. We have always felt safe in Zihua and this small and very desirable building is secure. Playa La Ropa is very near and it is a lovely walk into the charming town or a bus or inexpensive taxi ride away. We absolutely love Casa La Vida it is like a 2nd. home to us and we would not hesitate to recommend it. Once here you will not want to leave. La Ropa Beach is the nicest beach on the bay, only a few minutes walk from the condo. Close to restaurants and water sports. Also has lagoon with cocodrillos and nearby is a turtle hatchery.